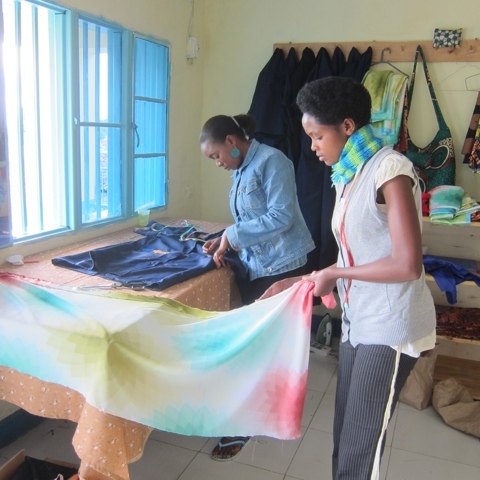 Urukundo Technical Sewing School opened in 2013 with 2 students and 5 treadle machines, which were purchased by donor Tom Nunnally from Pittsburgh, PA. In January 2018, 36 male & female students ages 15-32 enrolled in the 9 month training program. They will graduate in November 2018. Theresa our manager/head instructor added two male teachers, Redemption and Desire in 2015. We were thrilled to see the sewing center open and beginning operation in 2013. Five treadle sewing machines were purchased by donors in State College and at St. Paul's United Methodist Church. Our sewing center produces aprons for the kitchen staff, uniforms for the farmers, dresses for the primary school dedication, skirts and shoulder bags. Women and men will come daily to sew as well as learn to sew. Orders are coming in, so many hands are needed.